VCAs are essential to your synthesizer. They provide ring modulation effects, stereo panning, delayed vibrato, not to mention the normal envelope shaping of your sounds. This VCA works nicely with 10V PP (+/-5V) signal levels. If you are using +/-15 volt supplies you will probably need to mess with some values to get this to work for you. 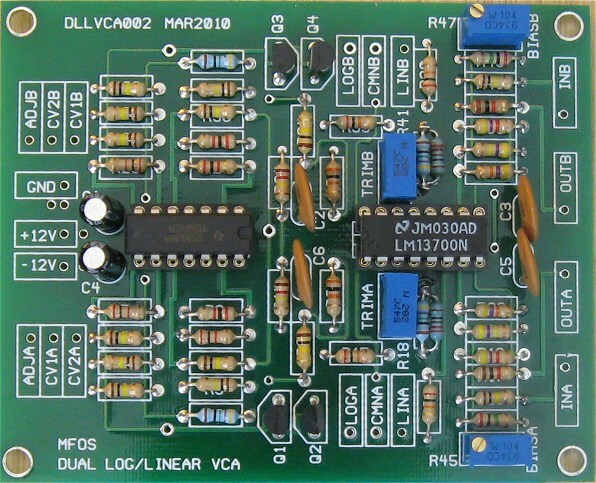 This VCA uses the LM13700 transconductance amplifier as the gain control cell. The input voltage is converted to a log response by U1-C and associated transistors Q1 and Q2. The summed control voltage appearing at the output of U1-C is sent to U1-D for reamplification and application to the LM13700 via R9 and S1. S1 selects the current generated by either the log version of the input voltage (LOGA on the schematic) or the linear version (LINA on the schematic) and applies it to the "amp bias in" pin 1 of the LM13700 thus controlling the current through the device and subsequent amplitude of the resulting voltage generated across R16. The LM13700's built in buffers are used to drive the output. They work quite well. The Offset adjust is used to null the gain for whatever control voltage you are using to drive the VCA. You must readjust the null when you switch from log to linear (or visa versa). I have noticed that for control signals that are operating about ground (i.e. + and - 4 to 5 volts) the pot is usually toward the left when set to linear response and usually toward the right when set to exponential response. The TRIMA control is used to set the voltage divider which feeds the non-inverting input of the LM13700 (pin 3). Adjust it for 50mV peak to peak signal at the maximum input voltage. It permits adjustment so that voltage from about + and - 3VPP to + and - 5VPP can be accommodated. You can use just about any general purpose quad BIFET opamp for the TL084 and you can sub any of these (LM13600, NE5517, AU5517, NTE870) for the LM13700. Just in case you are wondering, I have tried to use the bias inputs to forward bias the distortion reducing diodes in the chip but always find that it completely bugs up the biasing throughout the circuit. The new bias adjust injection point applies an offset voltage via 2M resistor R46 (R48) to the base of the darlington output transistor. With no input signal use the bias adjust trimmers to zero the output voltage. Page 2 is the same as page one but with different part designators. I will describe the trimmer adjustment using the designators from Page 1 (R18 and R45). Adjusting the trimmers on page 2 is the same (but the pots are R41 and R47). Disconnect any inputs or CV from the VCA. Set the Log/Linear switch to Linear. Connect the black lead of a DVM set to volt range to ground. Connect the red lead of a DVM set to volt range to the wiper of R10 (R32 for page 2). Adjust R10 (R32 for page 2) until you are as close as possible to 0 volts on the wiper. Connect the red lead of a DVM set to millivolt range to the output of the VCA. Adjust trimmer R45 (R47 for page 2) so that you have 0 volts on the output of the VCA. Connect a 100 hz +/-5 volt square wave output from a signal generator to one of the CV inputs of the VCA. Observe the output of the VCA with an oscilloscope (adjust the scope as needed). The control voltage should appear on the output but at a much lower amplitude. Adjust trimmer R18 (R41 for page 2) to minimize the control voltage feedthrough. If you have no oscilloscope you can listen to the output and adjust for least CV feedthrough. I used 475 ohm parallel with 220 ohm to get the 150 ohm resistor value I needed but did not have in my drawers. Jason Proctor took the time to make a nice Front Panel Express design and share it with all of us. If you use it make sure you take into account any differences related to the wiring diagram. (1) 4" x 10" 1/16" thick Aluminum plate for mounting the pots and switches. Knobs for potentiometers, wire, solder and typical assorted electronics hand tools.